eReflect shares digital marketing tips on the 7 Speed Reading™ blog. The significance of emotion in online content is highlighted in the article, noting that people are moved by emotional reasons and not by logic when looking to invest in a product or service. Targeting people’s perceived insecurities and inadequacies is what urges them to take action. eReflect, designer of popular reading improvement program 7 Speed Reading™, shares tips with online marketers and social media enthusiasts on how to leverage emotion in their online copy. This strategy helps them have a lasting effect on their readers and get the desired action from their post or advertisement, whether that's engagement, interaction, purchase, or referring others to a brand or service. Targeting people’s perceived insecurities and inadequacies is what urges them to take action. No one wants to be less pretty, less skinny, less fit than the beautiful people in every ad and movie. That’s why they seek immediate action, even if they also consciously dismiss these ads for what they are, marketing strategies to convert them into full paying customers. People are in a constant fear of missing out. They fear they will be deemed uncool and boring if they don’t participate in the consumer culture they’re members of. The four major emotions (sadness, happiness, disgust and fear) and their various combinations create the emotional spectrum a digital marketer can target in their marketing efforts to engage consumers effectively. eReflect’s editor says that making people feel happy can increase sales. When an ad or brand makes others happy then consumers tend to associate that brand or product with positive images and emotions. Viral news posts are more often than not happy news because people love to share joy and a good laugh with others. The post at the 7 Speed Reading™ blog also discusses the importance of sad emotional reactions as a way of building empathy and rapport with an audience. Targeting emotional reactions from readers and prospects is the first step in the buying process, and it's one that marketers need to pay due attention to, eReflect’s editor concludes. For more information about the benefits of using 7 Speed Reading, please visit the official website at http://www.7speedreading.com. 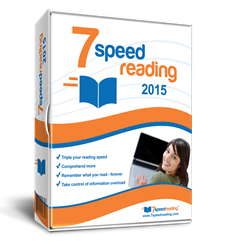 7 Speed Reading is the only modern speed reading software that uses the latest technology to produce superior results. The software provides its users with a new way to master speed reading that guarantees three times the reading speed along with improved memory and comprehension. The software is poised as the most comprehensive speed reading system anywhere. It contains seven learning strategies, fifteen software activities, video training, advanced tracking capabilities and many more exciting features.